(CNN) -- Like the pop icon himself, Michael Jackson's "This Is It" has become an international hit. The film, a behind-the-scenes look at Jackson's preparations for a 50-concert London tour, took in the highest gross ever for a Wednesday in October, earning $20.1 million from combined domestic and international sales, said Steve Elzer, senior vice president of media relations at Sony. 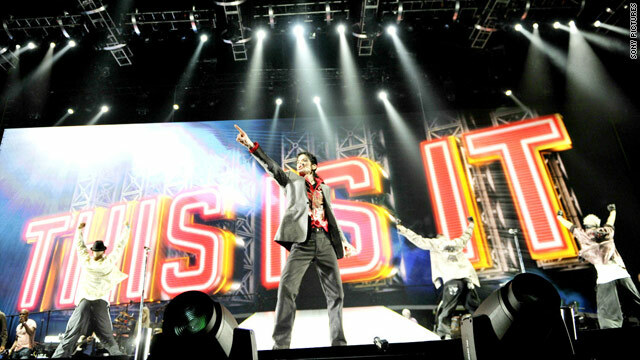 The studio purchased the rights to "This Is It" footage from concert promoter AEG for $60 million. Much of this was contributed by a strong overseas showing overseas: "This Is It" grossed $12.7 million internationally on opening day, compared to $7.4 million domestically. The film performed well in a number of countries, from the U.K. and France to China, Mexico and Brazil. The film opens in an additional 10 territories today. There were hints of the film's success midday Wednesday, when sales to matinees surpassed the $2.2 million the film generated on Tuesday night, which was "unprecedented for a Tuesday in October," Elzer said. On Tuesday, "This Is It" represented 61 percent of sales for online ticket seller Fandango.com, according to Fandango representative Harry Medved. Reviews of the film have been largely positive, and fans are mostly impressed -- the "consensus" on Rottentomatoes.com concludes that "while it may not be the definitive concert film some will hope for, Michael Jackson's 'This Is It' packs more than enough entertainment value to live up to its ambitious title." Frequent CNN iReport movie reviewer Rajiim Gross caught an advanced screening in Springdale, Ohio, and called the film "an awesome experience." The film will show in 99 countries, and early reports from overseas territories show strong late show and early matinee attendance, Elzer said. Another iReport reviewer, Tabitha Messick, watched the movie in Beijing, China, and also said the film is less like a traditional movie and more like viewing a live concert. "Everyone was screaming Michael's name, clapping and singing along," she said. Sony is counting on the positive buzz to keep the film afloat as it enters into the more competitive weekend box office.